West Cork. The Beara peninsula. Eyeries. 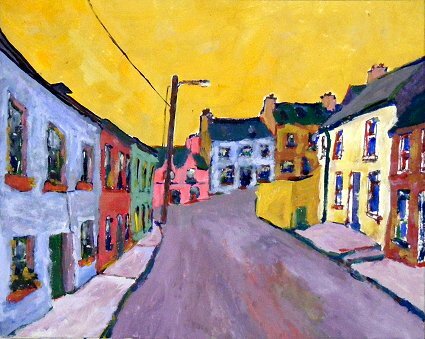 I actually like the unpainted grey villages of Ireland, especially when wet, but one day somebody went around with buckets of paints, a lot of them pastels, and painted a tourist industry. Regardless of colour, I like buildings that are closely packed together. This painting, Eyeries, is now SOLD. This painting comes in an archival sleeve. Eyeries is part of the End of Year 2009 online sale of paintings, which has launched with paintings at half-price and FREE shipping worldwide until Christmas Eve. Dozens of new paintings are being rolled out on my personal blog Bicyclistic in batches of 5, 6 and 2, 3. To see announcements first follow me on twitter.